What if I need repair service on my phone line? Simple tests can be done to determine whether or not to call in a repair ticket. These tests may save you time and money. Report repair services to 877-537-4403. Hang up all telephones. Make sure phone accessories- answering machines or fax machines, computers, modems, security system and telephone sets- are working. 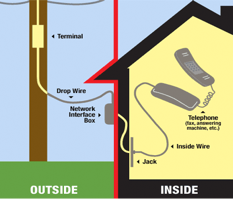 To check, unplug the phone cord from the unit or jack and check for damage. Leave everything unplugged for 5 minutes. Then try plugging in a non-cordless phone set one at a time to see if the trouble still exists. If all the phone accessories are working, go to your network interface box. (Outside, where the phone lines enter the house). Take a working phone to the network interface box (single line phones only). 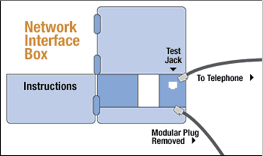 Remove the modular plug from the test jack and insert the modular plug from your phone. The problem may be the phone lines. Call your local telephone service provider. If the problem is in the phone lines, they will repair the lines at no charge to you. The problem is in your wiring. Call your local telephone service provider to repair your inside wiring. Follow the instructions on your warranty or contact your equipment retailer for repair of replacement.